One sophomore project at Manor New Tech High School was based on the best-selling novel The Hunger Games. Examples of how they incorporated English and world history standards into the project are below. Educators often want to know how they can use PBL in their individual classroom. Project-based learning can be applied in any content area or any grade, but it may look very different across subjects. In the series of examples below, you will find descriptions of actual projects and exercises teachers have implemented in schools around the country, as well as links to the research reports on their outcomes. It should be noted that there are also many wonderful examples of cross-curricular projects, where teachers from two or more core subjects work together on a project. For an example, check out our Schools That Work package on an interdisciplinary project at Manor High School in Texas. Urban students in grades 3-5 received inquiry-science instruction. Matched pre- and post-tests found substantial learning gains and a cumulative effect that lasted over several years (Lee, Buxton, Lewis, & LeRoy, 2006). Fourth graders learned science through PBL or through traditional methods with the same teacher. The PBL curriculum involved figuring out a way to create electricity during a blackout, as blackouts had commonly affected the school’s region. PBL students had fewer stereotypical images of scientists on a “draw-a-scientist” test and were able to generate more problem-solving strategies than students in the traditional group. Content knowledge learned was equivalent in both groups (Drake & Long, 2009). Urban middle school students engaged in a standards-based, inquiry-based science curriculum in ten middle schools showed higher levels of achievement on a curriculum-aligned test than students who received traditional instruction in a district-comparison group (Lynch, Kuipers, Pyke, & Szesze, 2005). 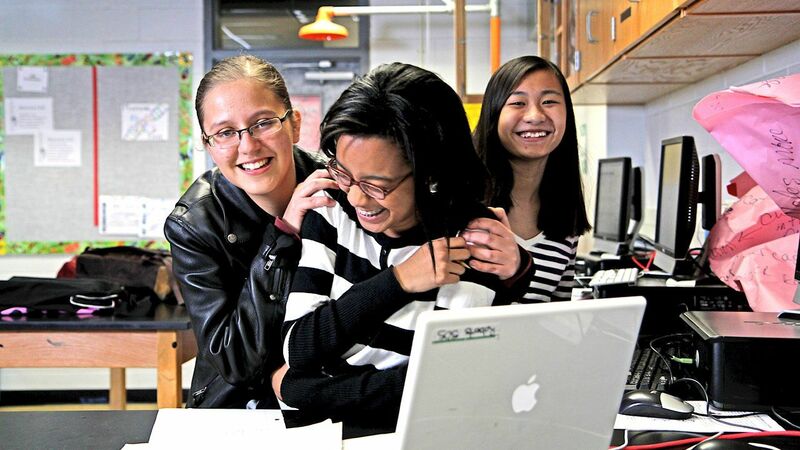 Urban middle school students engaged in PBL showed increased academic performance in science and improved behavior ratings over a two-year period (Gordon, Rogers, Comfort, Gavula, & McGee, 2001). Urban students in grades seven and eight who were engaged in the LeTUS inquiry-based science curriculum demonstrated higher standardized test scores than students engaged in traditional instruction in a sample of 5,000 students. The LeTUs inquiry-science curriculum involves eight- to ten-week units addressing questions such as What Is the Quality of Air in My Community? or What Is the Water Like in My River? and is aligned with professional development, learning technology, and administrative support (Geier, Blumenfeld, Marx, Krajcik, Fishman, Soloway, & Clay-Chambers, 2008). Middle school students engaged in Learning by Design (LBD) consistently outperformed students engaged in traditional instruction on tests of collaboration and metacognitive skills, such as checking work, designing fair tests, and explaining evidence. LBD students also learned science content as well as or better than students engaged in traditional learning methods, with the largest gains among economically disadvantaged students (Kolodner, Camp, Crismond, Fasse, Gray, Holbrook, Puntambekar, & Ryan, 2003). Middle school students who received a computer-enhanced PBL unit had a better understanding of science concepts and felt more confident about being successful learners (Liu, Hsieh, Cho, & Schallert, 2006). Tenth-grade earth science students who engaged in PBL earned higher scores on an achievement test as compared to students who received traditional instruction (Chang, 2001). High school students engaged in PBL in biology, chemistry, and earth science classes outscored their peers on 44 percent of the items on the National Assessment of Educational Progress science test during their twelfth-grade year (Schneider, Krajcik, Marx, & Soloway, 2002). Students in grades five and up in 11 school districts learned math problems through videotaped problems over a three-week period (The Adventures of Jasper Woodbury series). The PBL students showed improved competence in solving basic math word problems and planning skills and more positive attitudes toward math (Cognition and Technology Group at Vanderbilt, 1992). PBL increased learning of macroeconomics at the high school level, as compared with traditional classes, in a sample of 252 students at 11 high schools (Maxwell, Mergendoller & Bellisimo, 2005). A randomized, controlled trial in Arizona and California in 2007-08 examined the effects of a project-based economics curriculum developed by the Buck Institute for Education on student learning and problem-solving skills in a sample of 7,000 twelfth graders in 66 high schools. Seventy-six teachers received 40 hours of professional development in teaching economics with PBL instead of their normal professional development activities. Students who received PBL scored significantly higher on problem-solving skills and in their ability to apply knowledge to real-world economic challenges than students taught economics using traditional methods. Economics teachers who used the PBL approach reported greater satisfaction with the materials and methods, and no significant differences were detected between intervention and control-group teachers (Finkelstein, Hanson, Huang, Hirschman, & Huang, 2010). Four veteran teachers taught macroeconomics using PBL in one or two courses and traditional instruction in another course. 246 twelfth-grade students in 11 classes completed pre- and post-tests in macroeconomics. Results showed that PBL was more effective than traditional instruction for teaching macroeconomics concepts (Mergendoller, Maxwell & Bellisimo, 2006). Second graders from low-income backgrounds participated in two project-based units which integrated literacy and social studies. The outcomes on standards-based social studies and content literacy assessments indicated that the project-based learning curriculum virtually erased the achievement gap between second graders of high and low-socioeconomic backgrounds (Halvorsen, Duke, Burgar, Block, Strachan, Berka, & Brown, 2012). Students in grades four and five collaboratively researched primary and secondary sources to discover themes and reasons for human migration in the local region. PBL students showed improved reasoning and collaboration skills and increased knowledge of local history and communities (Wieseman & Cadwell, 2005). Eighth-grade groups created mini-documentaries about their interpretation of a time period in the 1800s, using state standards as the content guide and presenting their completed work in a public event. PBL increased students’ content knowledge and historical-research skills (Hernandez-Ramos & De La Paz, 2009). High school students using PBL in American studies performed as well on multiple-choice tests as students who received a traditional model of instruction, and they showed a deeper understanding of content (Gallagher & Stepien, 1996). In the Knowledge in Action Research Project, high school students learned Advanced Placement U.S. Government with PBL or traditional instruction. The PBL course consisted of a public-policy action proposal and four role-playing projects: designing democracy, simulating legislation, a Supreme Court case, and an election. The PBL students showed improved performance on a complex scenario test, measuring strategies for monitoring and influencing public policy, and performed as well as or better than traditionally-taught students on the AP U.S. Government test (Boss et al., 2011; Parker et al., 2013; Parker et al., 2011). Learn more about the study's results to date and its course design. Continue to the next section of the PBL research review, Avoiding Pitfalls.